We were planning to have Sutli or Suta Kabab for quite some time. Finally we decided to go to Phears Lane on 8th November 2015. As usual we (Abhik, Koyeli, Oli and Rumki) were late. We reached there by car at around 9.20 pm. 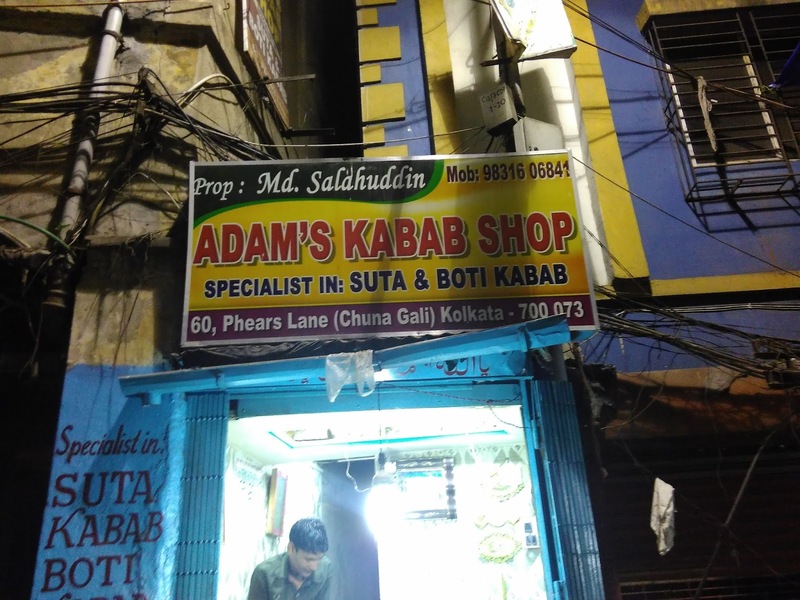 When we reached Adam’s Kabab (run by Mohammed Salahuddin) has just closed. They said there are some other places, where you can also get Sutli Kabab and Boti Kabab. We read that it opens only during the evening hours and is located next to the Liyaqat Sweet Shop. It is 2.5 / 3 minutes walk from main road. In fact the best way to go there is by subway /metro and get down at Central Metro station. But do not get down at BB Gangluly street (towards Lal Bazar) exit of Metro, rather take the India Exchange Place Road/Medical college exit of Central Metro. Now start walking towards Tea Board/Brabourne Road. The first road on the right is Sagar Dutta Land and then after two three roads on the right comes Phears Lane (basically 300 metres from Metro station) - very narrow road - just one car can pass somehow. We started walking towards Zakaria Street. First we reached Maulana Saukat Ali Street. There is a small road which connects Phears lane to Bolai Datta Lane (Colootala). That lane is apparently called Kababwala gully, we were told (which is basically an extension of Phears lane after crossing Maulana Saukat Ali Lane). 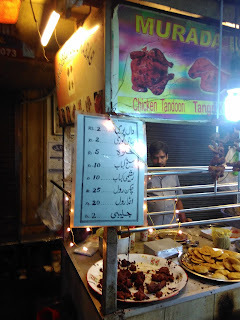 We saw a shop selling Sutli Kabab. "Initial look gives the impression of an shikh Kabab , with meat being grilled in fat skewers over flaming red charcoals , but a closer inspection reveals that the meat being barbecued are tied to the fat skewers using a fine cotton thread !" For the uninitiated, Sutli Kebabs, kebabs so soft or delicate, they have to be held together with a twine of thread. You actually have to hold the thread tied over the kebab from one end, and it spreads on your plate, when unfolded. "Unlike the shikh Kabab, which stays on the skewer, the Sutli or suta Kabab disintegrates unless tied together with a thread". Dhaga Kabab or Sutli Kabab is a several centuries old Mughal dish that is now seldom made. Small pieces of beef, but not minced, marinated with herbs and spices are put around the skewers. The secret to this is unripe papaya, an excellent meat tenderizer, mixed in with the mince along with spices and left to marinate. Then the cotton thread is soaked in water and is rolled over the meat. According to a blogger (reference given) "The only other place I’ve had Sutli Kababs is in Old Delhi. 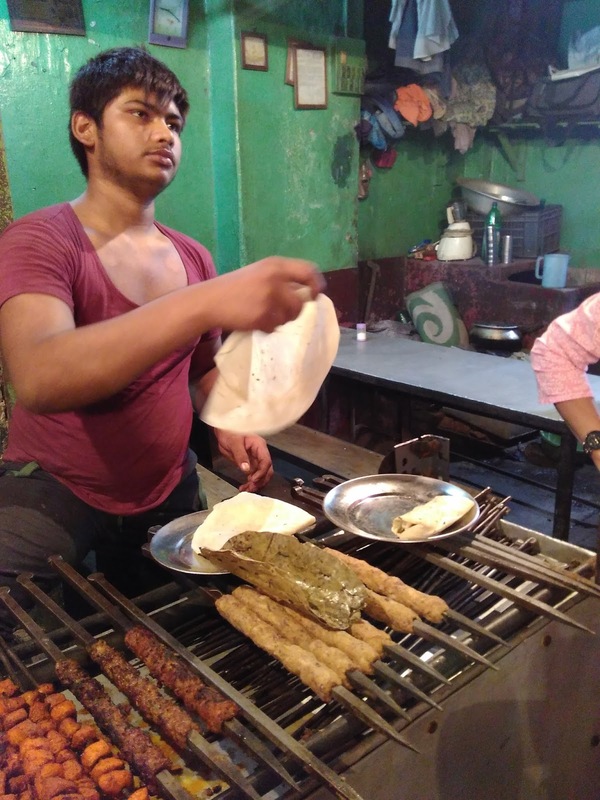 There, in the Matia Mahal area, past the overrated Karim’s, is the oddly named Kale Baba ke Kebabs. 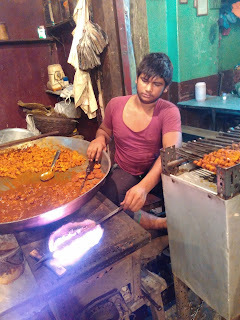 As in most Mughlai food though, the colonial melting deg of Kolkata steals a march over once-upon-a-time-Mughal Delhi." 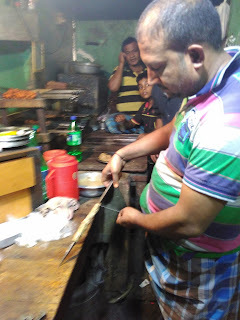 We ordered 4 for skewers for us - they rolled it in romali roti. It is an unnamed shop. It is really good and one of the best Kabab I had for a long time. It’s really a melt in the mouth experience!!! Kabab is soft, quite juicy, not as soft as galawati but very spicy. The Sutli or Suta Kabab costs Rs 20 per plate and the romali roti costs Rs 3. So the best part is the price!! Then we started walking towards Zakaria Street. 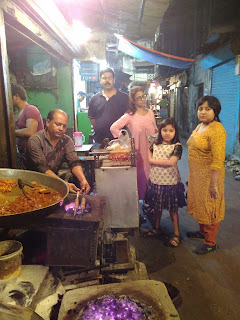 On reaching Colootala Street we saw another restaurant selling Sutli Kabab. They have been featured in Wheels Magazine. 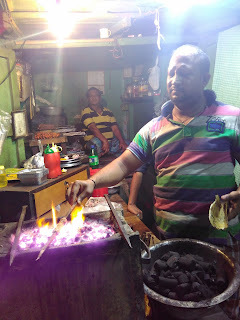 They also sell Khiri Kebab (made with the cow’s udder), Malai Kebab (Rs 10). 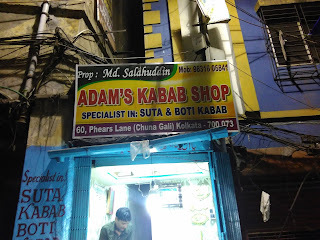 We also had Boti Kabab and Malai Kabab apart from Sutli Kabab. I somehow liked the first shop better. According to a blogger ( reference given ) "This is the city’s Kabab district. Colootala and Phears Lane are replete with hole-in-the-wall eateries selling every variation of skewered meat. During the month of Ramadan, the entire Zakaria Street turns into a food bazaar. Small stalls selling Bakarkhani & Sheermal Breads, Murgh Changezi, Mahi Akbari, Sewaiyan, Rogni Roti, Shahi Tukras, Haleem, Biriyani and countless other delicacies jostle with stalls of colourful bangles and clothes. From November to February, you can find delicious Nihari early in the morning. " We were told if we come at 7 am in the morning then we can have Brain or Magz curry. If you walk little forward you will reach Zakaria street. You can see Nakhoda mosque and just in front of Nakhoda mosque you will find Aminia. 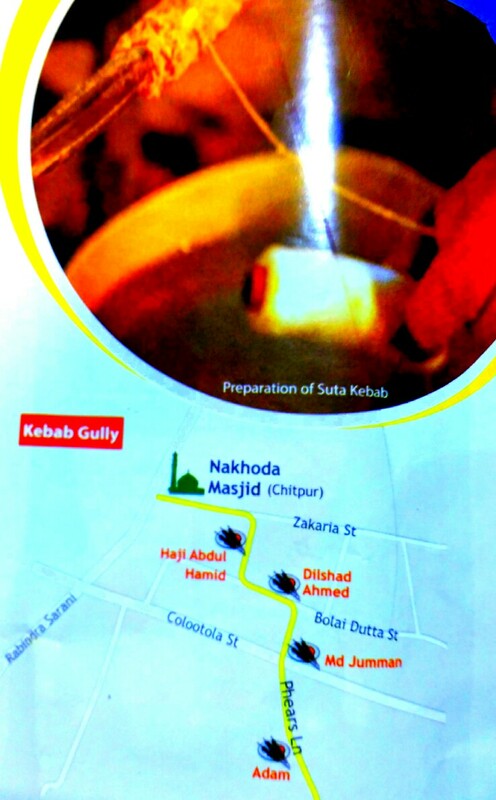 There is labyrinth of shops selling Kababs - mostly beef. So it is a beef eater's paradise.